If you want to have the ability to preview source code files that sent to you by email as attachments in Microsoft Outlook 2007 or located on local drive when you select or highlight the files, without the need to actually double click on attachment or file to open it up in external text editor or programming interface, now you have more choice. Other than Windows and Office Preview Handler Pack custom previewers or preview handlers that provides support for .cs, .aspx and .sql source code files, now there is Code Preview Handlers which provides almost the same previewers support. 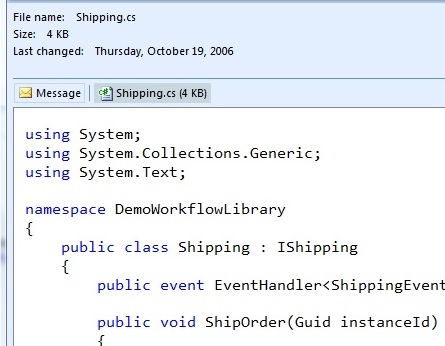 Code Preview Handlers include custom previewers for .cs, .vb, .js and .sql files and enable a previewer to show them in code-highlighted formatting in the preview window or preview pane of Microsoft Outlook 2007 or Windows Vista Explorer. Download Code Preview Handler (setup .msi) or review the Code Preview Handler source (no longer available).